This is a fun game that anyone can play. 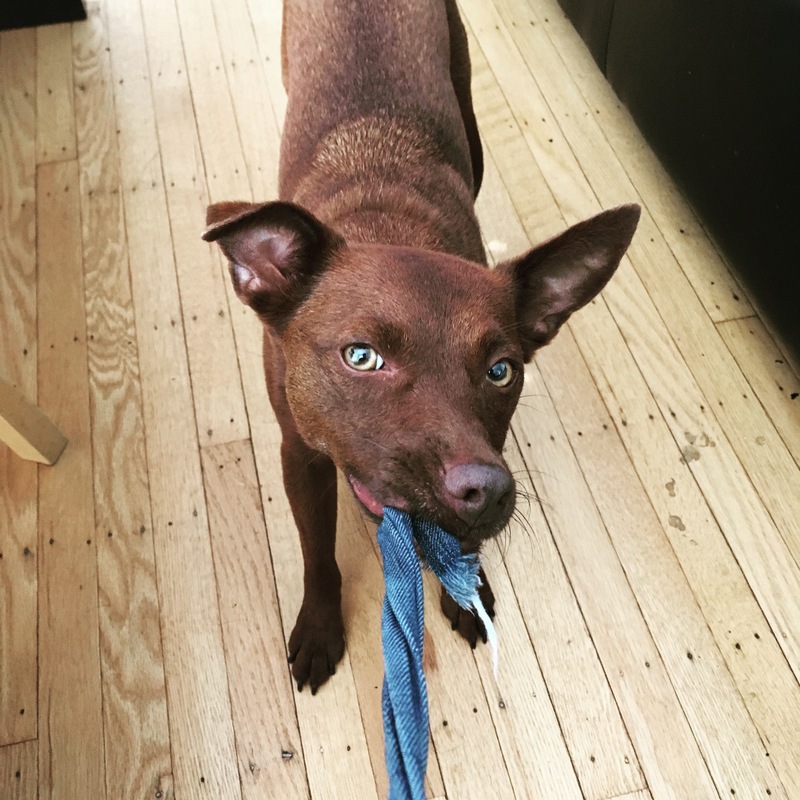 Dogs naturally know how to tug. 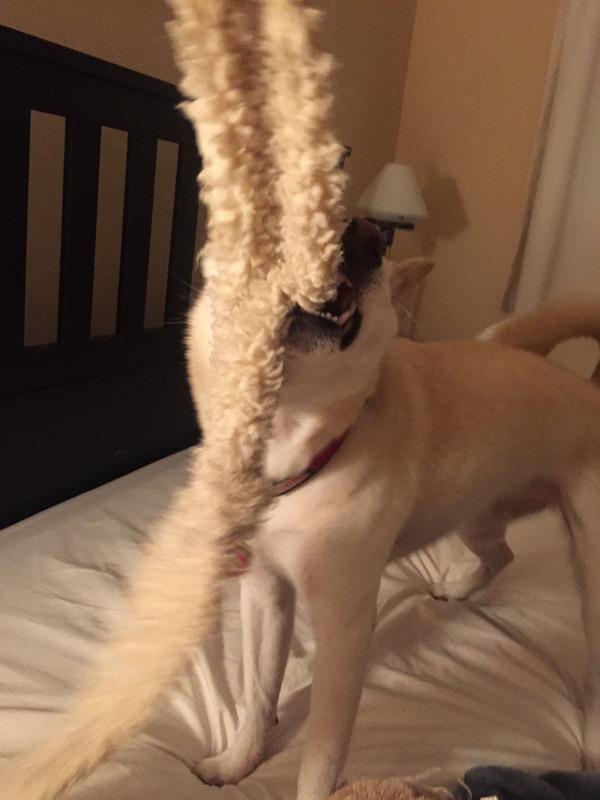 Make sure you pick a tug toy that is long enough so that there is room for your dog to grab on one end and you to safely hold on the other end. Remember that you should always be the one to initiate a game of tug. To initiate a game of tug, ask your dog to sit and then wave the toy in front of your dog while you ask him to “take” the toy. Then tug away! Practice having your dog “drop” and “take” the toy. Teach your dog what acceptable play means. If your dog does not play well or bites you in any way, say “ow” to signal that you your dog is hurting you. End the game and initiate play only when your dog calms down and sits. It’s actually good to keep playtime short so your dog keeps wanting more! If your dog is aggressive or jumps up tell him “No” and end the game for awhile. Submit a photo or video of your dog playing tug with you. Did it take him long to learn to play? What is his favorite tug toy? Safety: If your dog is a puppy or has a special condition consult your vet. Monitor your dog and stop playing if he becomes too aggressive. Seek additional training if your dog becomes possessive of his toys or food. He may show this by stiffening up, growling or baring his teeth at you. I used to give Carmella the Invincible Gecko Dog Toy which had multiple squeaky balls inside to entice her. She loved it and we played long enough for the name "squeaky" to stick as any tug toy. Carmella is queen of destruction, so it's only a matter of time, sometimes minutes, before her toys have no squeaks, stuffing, or form. We are always on the hunt for new, ultra-ultra-durable toys with long-lasting squeak! Wheeeee! Nala loves her sheepskin toy.